Velvet Paw Creations: Halloween Luminary for Carmen's Veranda! Halloween Luminary for Carmen's Veranda! Anyway, I'll be playing catch up this week but here's today's share, my Day 19 project for Lost Coast Portal to Creativity. 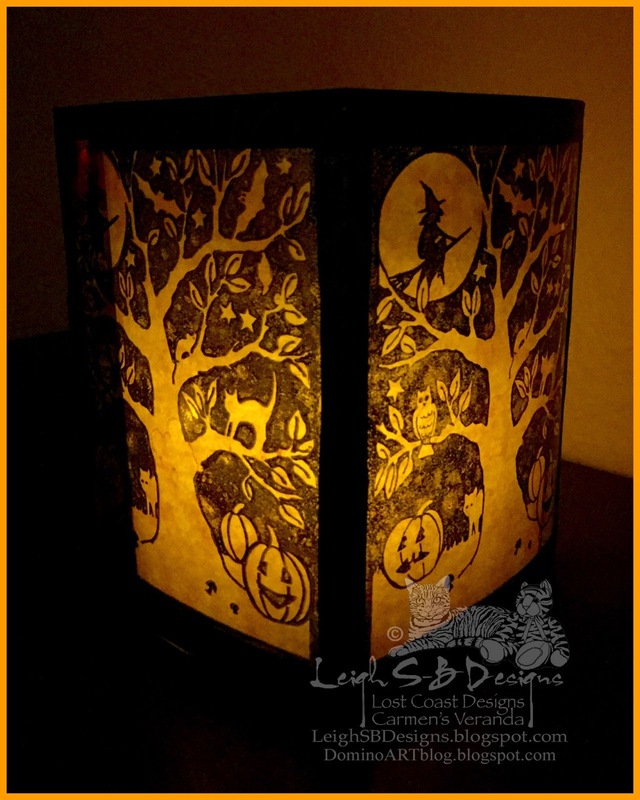 I made a spooktacular Halloween Luminary featuring stamps from Carmen's Veranda, Halloween Background and Flying Skull. I love working with faux stained glass effects and this one came together nicely. The luminary is quite large, measuring at 5.25" square and 6.75" high. I've got a tall 3" wide flameless candle in there but you can easily create a candlescape with a few in varying sizes. The photos above show the luminary with a white paper insert acting as a light diffuser and the last photo shows it without for more of a stained glass effect. In the photos below you can see how pretty it is in daylight too. I stamped 4 panels of clear artist's overlay acetate with the Carmen's Veranda Halloween image in jet black StazOn ink and applied Watermelon and Sunshine Yellow Ranger Adirondack Brights Alcohol Ink with an ink applicator. I designed the cardstock frame to fit the stamp perfectly, cut eight window panels with an Xacto knife and stamped them all with CV's Flying Skull in Brilliance Pearlescent Purple ink. Even in the dark the pearlescent ink glows too. The frame folds were scored on a scoreboard and the acetate panels adhered to the inside of the four front facing windows and the remaining four were added to the inside for additional stability and to make the inside look just as gorgeous as the outside. Besides all the fabulous prizes up for grabs in the hop with Smeared Ink you can also enter your Halloween and Day of the Dead makes in our various Halloween activities too! We currently have 3 faBOOlous prizes you can win over at Lost Coast Portal to Creativity, all the info is below so I hope you'll come on over and join the fun! 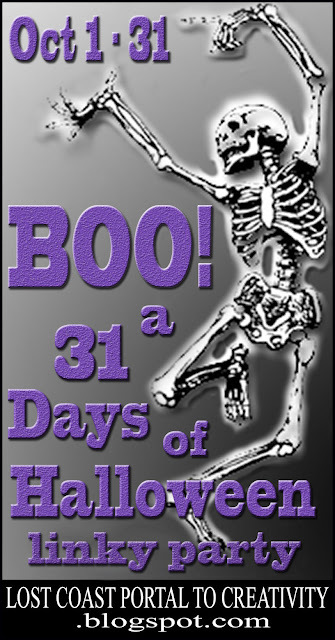 Enter your spooktacular creations in BOO! our linky party HERE to win a $15 spending spree to LCD/CV! You can also enter our first LCD/CV Facebook Challenge currently taking place on both of our FB Pages, Lost Coast Designs and Carmen's Veranda! 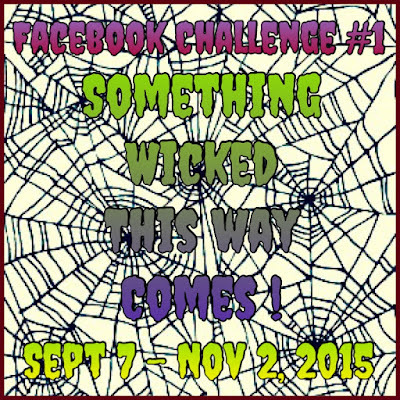 Click on over, read the pinned posts and enter Challenge #1 Something Wicked this Way Comes! You can also enter our current monthly blog challenge #17 MONOCHROMATIC too! Our Challenge prize is based on amount of entries received & you can enter as many times as you want so tell all your friends and come and play with us ;0) Please make sure you read our blog event & challenge rules & our Facebook rules to ensure you qualify to win! Thanks for visiting me today and stay tuned for more fun projects, I've been a busy bee! Oh wonderful, I love the glow showing off the great stamp! I'm going to have ago of this one! Ang going to try a Chritmas one to! Vaguely Goth digi art - Forever Dark DT!